We like to give books to babies. And we're at the point in our life where many of our friends are having babies. As a result, I spend a lot of time on Amazon buying books. 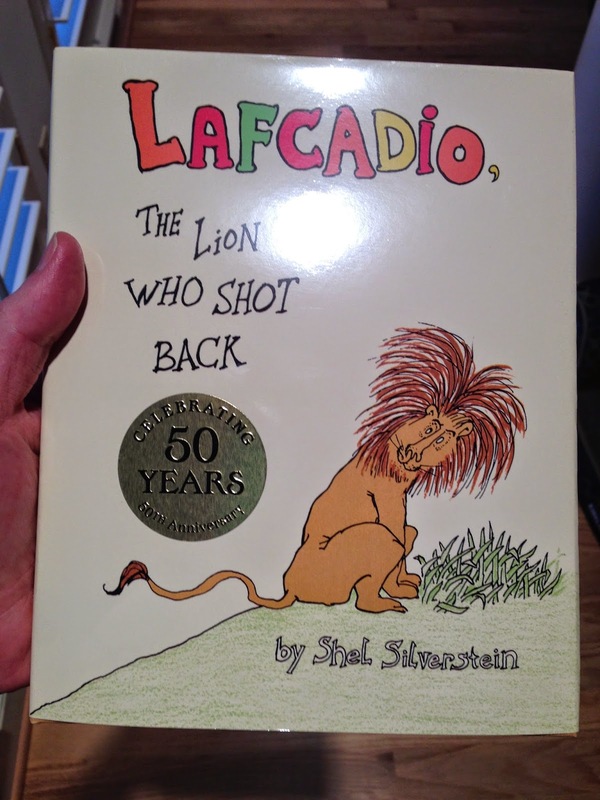 Recently I stumbled upon one of my favorites Shel Silverstein books, Lafcadio, the Lion Who Shot Back. My mother was an epic public school educator, and on the last day of class one of the books she read aloud to her students was Lafcadio. The story is entertaining, but it also carries an important message. Lafcadio succeed at something he was not (being a man) and as a result he forgot who he really was (being a lion). His success brought him fame and fortune, but it didn't bring him happiness. In fact, the more success he achieved the more unhappy he became. The book ends with Lafcadio questioning is he now a man or is he a lion? He decides he is neither and wanders alone into the valley. One of the many things I adore about my mother is the importance she placed on reading and books as I was growing up. The books of my childhood are old friends, and they make me happy to read again. Awh - you are so sweet. You know this puts warm tears in my eyes and a lump in my throat. I love you so.